Failure to comply with federal employment laws can have serious costs and ramifications for employers. Two key federal laws that organizations must understand are the Americans with Disabilities Act (ADA) and the Family Medical Leave Act (FMLA.) This Reference Guide, developed by Katie Weaver Hartzog, provides an overview of the interacting provisions of the ADA and FMLA. 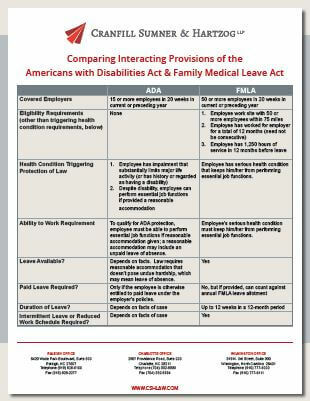 Enter your email below to access "Comparing Interacting Provisions of the Americans with Disabilities Act and the Family Medical Leave Act. 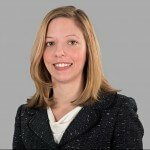 Katie Weaver Hartzog is a partner in the firm’s Raleigh office and focuses her practice on employment, education, and municipal law. Katie regularly advises employers, including businesses and governmental entities, regarding all aspects of the employment relationship including legal compliance and avoidance of litigation. Katie also represents employers with employment-related disputes and litigation in North Carolina state and federal courts and administrative agencies.